A web application which helps organic farmers tell the story of their farms engage with their communities, exciting the public with knowledge about the real life behind authentic, sustainable food sources. Quality is increasingly central to consumers’ decision on food as they become increasingly aware of what they eat. To choose healthy foods, they need to know how it was made as well as what goes into it. Although many more people take an interest in the provenance and quality of food, there are few easy-access sources of information about it, aside from what’s written in small print on product labels. And few farmers have relevant skills to engage digitally with users to build communities, promote their businesses and practices. We co created the Storytelling app which offers farmers an easy way to show how the cycle of farm routines or key decisions yields quality products and local knowledge. For farmers it is a great way to become better known: to sell produce via authentic content online, to retain customer fidelity, to receive visits from direct customers or run more events on the farm, or simply put themselves on the map. For consumers, they get an easy glimpse of the culture and real-life behind the sources of their quality products…and certainty about the sustainability of the source. This pilot started out aiming to optimise farm shops, with the need to align their produce to demand by questioning clients. In true start-up style we quickly pivoted when we realised it would make a big difference to producers if they could communicate their story in an interactive way, so consumers could find out more and pursue their passion for sustainable sources. The pilot demonstrator aims to help farmers inform consumers about their farm and to show how they produce sustainably. 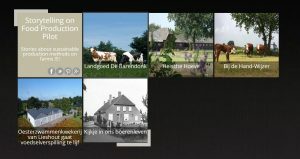 The simple-to-use virtual tool Help farmers compose and edit stories about their production and inform visitors, while collecting feedback from them to improve the stories. When they sign up, a how-to guide with examples and tips helps farmers start composing their own stories and adapt or supplement them afterwards. The story then becomes visible in the online portal and can be presented on other channels to best reach target audiences. We expect demand for this pilot to grow. The demand for authenticity overall is growing not just in food but in tourism, recreating and education. The ‘authentic’ values of organic and biodiversity farming are becoming important factors in regional economies as people seek breaks and holidays in areas promoting environmental sustainability ethics. The farms can provide great ‘stories’ to inspire people as well as provide them healthy food. in the face of global markets, smaller biodiversity farms are in fact increasingly important as bedrock of local knowledge and culture. this inspiration rooted in diversity is in fact at the root of global innovation value chains. This pilot was shortlisted for the European Digital Skills Awards 2017.